Goal: To synthesize new materials that will have a transformative impact on solar light absorption, conversion efficiencies, and manufacturing costs. 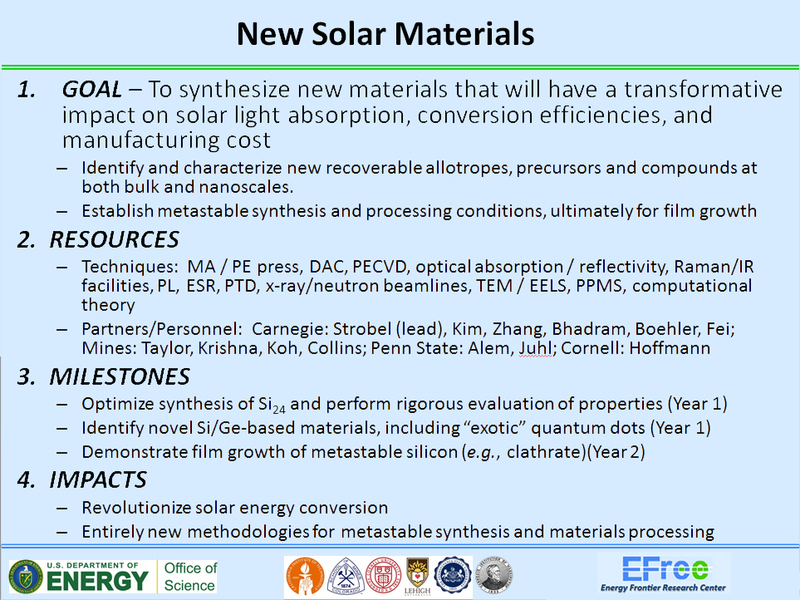 Overview: The EFree New Solar Materials Project focuses on the synthesis of new materials that may have transformative impacts on solar light absorption, conversion efficiencies and manufacturing costs. 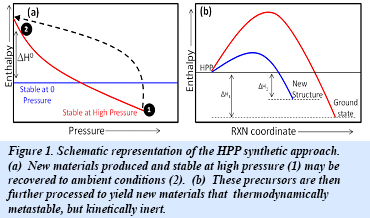 In this project, access to revolutionary materials is provided through a combination of unique high-pressure/temperature conditions and novel metastable materials processing. The resulting new materials are fully stabilized at ambient conditions with possibility for larger-volume scaling. Solar energy is an attractive resource with supply in far excess of potential future demand. Energy derived from the Sun, however, at present only represents a small fraction of total energy consumption, and the large gap between present usage and undeveloped potential signifies a major challenge in energy research as outlined in the DOE/BES Report on Basic Research Needs for Solar Energy Utilization. In order to make solar energy economical, transformative materials advances are needed to improve conversion efficiencies and reduce manufacturing costs. For example, new earth-abundant structures that effectively absorb solar photons would reduce absorber layer thicknesses and minimize electron transport distances. In addition, novel quantum-confined structures with optical gaps well matched to the solar spectrum could exhibit efficiencies far exceeding the Shockley-Queisser limit. Extreme conditions of pressure and temperature represent a largely unexplored space for novel materials with transformative properties. In EFree, we use these unique conditions to synthesize entirely new materials that are recoverable to ambient pressure. We have also adopted a novel high-pressure precursor (HPP) approach, with which high-pressure materials are recovered to ambient pressure and treated as chemical precursors for further manipulation, giving even greater access to new materials (Fig. 1). Current research in the New Solar Materials Project is largely focused on novel forms of silicon and silicon-rich alloys. Silicon is the second most abundant element in the Earth’s crust, has relatively low costs, maintains a native oxide passivation layer, and is readily doped by other elements. 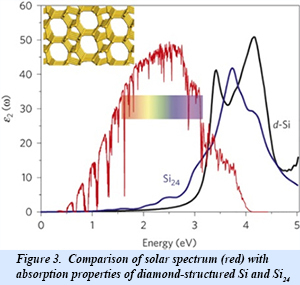 The light absorption properties of silicon are, however, significantly hindered by the indirect band gap of the diamond structure, which requires thick layers of ultra-pure Si for photovoltaic devices. We have synthesized a new allotrope of silicon that may help overcome limitations of diamond-structured silicon. 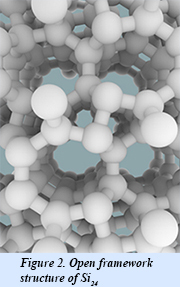 The new structure, Si24, contains open channels formed by sp3 bonded silicon rings (Fig. 2). This open framework structure possesses a quasidirect band gap of 1.3 eV, allowing for improved light absorption in the spectral region associated with maximum solar conversion efficiency (Fig. 3). Si24 was synthesized using the HPP methodology. First, a Na4Si24 precursor was synthesized at high pressure and recovered to ambient conditions. Next, sodium was completely removed from the precursor by heating under high vacuum conditions. We are currently optimizing the synthesis of Si24 and producing single crystals for the precise measurement of optoelectronic properties. We are also exploring the synthesis of quantum-confined silicon nanoparticles that have optical gaps matched with the solar spectrum and exhibit multiple exciton generation. Experimental efforts within EFree are closely tied to theory. We use density functional theory combined with state-of-the-art crystal structure searching algorithms to predict new structures and their synthesis conditions. Once stable structures are predicted, accurate electronic and optical properties are calculated to help establish important physical parameters for solar materials.